This disc of Germany flute music contains some interesting repertoire by well known composers such as Hindemith and Henze. We also hear from the perhaps less well known, such as Karg-Elert and Genzmer. Khaner and Abramovic play the first movement of Gieseking’s Sonatine with a sense of gentle grace; the playing is unforced and straightforward, showing the delicate eloquence of the melodic lines and giving a sense of flow throughout. The playful central movement has a dancing feel, with repeated rhythms in the accompaniment at the opening helping to give character to the music. The music unfolds with a sense of adventure and a welcome joyful exuberance. The final movement has drive and energy, with the technical demands easily controlled by both players, allowing the music to sparkle. Genzmer’s Sonata No. 2 is written using slightly more complex language and has resonances of his teacher, Hindemith. Genzmer was a prolific composer who also worked as a clarinettist and spent some time as a military bandsman. His music has a rhythmic precision which seems to change emphasis during long phrases so that a strong pulse resides throughout. The phrases have a constant sense of direction and one has the sense here that the performers have a real understanding of the music, which communicates well to the listener. The final movement has a folk-music influence and a lighter character. Hans Werner Henze is perhaps one of the best known living German composers. His flute Sonatina was composed in 1946 and brought Henze’s music to the attention of his publisher, Schott, with whom he has worked ever since. His music shows the influence of both Hindemith and the twelve tone system, and there is much of interest in this short work. 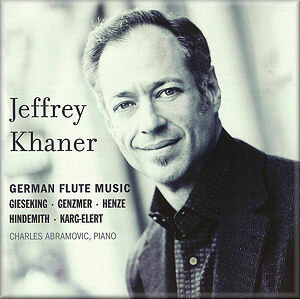 The first movement is aggressive and energetic, while the central movement takes on the mood of a lullaby, demonstrating Khaner’s sweet and beautifully controlled quiet playing, with Abramovic playing with equally sensitive phrasing and a warm sound. The last movement has moments of rhythmic drive interspersed with more lyrical passages which use the same rhythmic ideas but with a completely different character. The poignant ending is particularly enjoyable. Hindemith is the father of twentieth century German music, and his Sonata is one of the staples of the flute repertoire. The first movement serves as a statement of intent, with a warm sound and defined phrases. The exquisite slow movement is beautifully played here, with a wonderful range of expression and intensity from these excellent performers. The third movement has sparkle and a galloping momentum which remains always in control but retains its feeling of exhilaration. Sigfrid Karg-Elert is something of an under-rated composer, but his music has much to offer. Another former military bandsman, Karg-Elert had experience of playing the flute and other instruments, including the organ, for which he also frequently wrote. His music is often complex, with many harmonic twists, but also contains the essence of late Romanticism. The Sinfonische Canzone is a one movement work with a lyrical main theme and a light and sparkling central section. The extended flute cadenza is particularly impressive, with evenness of technique and a beautiful range of tone colours. This is an excellent disc, with mature performance values from some first-rate players. I was particularly impressed with the phrasing and expression; there is a sense of honesty here and excellent communication of the composer’s intentions. This is a recording with integrity which deserves to be heard.